Ask any Sookie Stackhouse fan which book is the best in the series, and you’ll be hard pressed to find one that doesn’t pick Dead to the World. This is the very best that the series has to offer. And the crowning jewel of this masterpiece: a Viking Vampire with amnesia. Thanks to the events in Club Dead, Sookie’s relationship with that asshat Bill is over. And as this book begins, Bill is heading off to Peru to work on his vampire-directory project. Shortly after he leaves, Sookie finds Eric, running barefoot on an old country road with no memory of who he is or how he got there. She brings him back to her house and learns through his second-in-command Pam, that he has been cursed by a powerful witch. Her coven is now searching for him and Sookie has to hide him in her home until the vamps can smoke out the coven. At the same time, Sookie’s brother Jason goes missing. And Sookie must divide her time and attention between searching for him and taking care of her houseguest. The nefarious witch and her reign of terror ends up drawing in the Weres, which means we are treated to some more of the luscious goodness of one Alcide Herveaux. We learn more about his pack… and unfortunately, we’re subjected to more Debbie as well. Let me be clear when I say, I love Eric. But Harris paints Alcide as such a great alternative in these early books –if only he could just get over that horrible, horrible woman. In addition to the introduction of Alcide’s pack members, we learn more about Crystal and the shifters in Hot Shot. (They’ll feature prominently in the next book.) And we meet Claudine, a Fairy who will become a big part of Sookie’s life. I agree! Definitely the best in the series. I’ve read this one 3 times! Definitely my fave book of the series; I’ve lost track of the amount of times I’ve read it, must have been loads! I’m totally team Eric!! and I agree with you about Bill, he’s awful. I hate him! 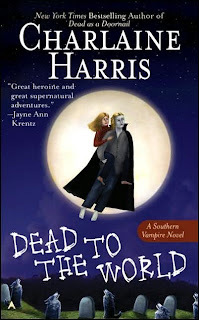 I keep trying to check out Harris’s novels at the library. Guess I will have to resort to bribery soon if I can’t get my grubby paws on at least one! Hey Jen, just stopping by on the follow. I justed wanted to say Thank you, you are always so kind as to leave comments on my blog. It’s always a joy to read what you have to say. I’m so fickle my favorites change quite a bit. Come over and visit and see what I think this week. I love the side of Eric we see in this book. To see what he could be like…This book forever endeared him to me if the idea of him in pink spandex didn’t lol! I also liked meeting Calvin Norris.